It’s 7:00 p.m. and the Huskies are hungry. Fortunately, it’s Burger Night — the most popular meal of the week at Training Table, the student-athlete dining room in Conibear Shellhouse. From the tiniest gymnast to the tallest basketball player, young women and men will consume 180 pounds of ground beef, 40 pounds each of veggie and salmon burgers, and 70 pounds of fresh vegetables. But the chef-prepared menus aren’t just delicious. They’re grounded in the science of what it takes to fuel top athletic performance, tailor-made to individual sports, body compositions and training goals. 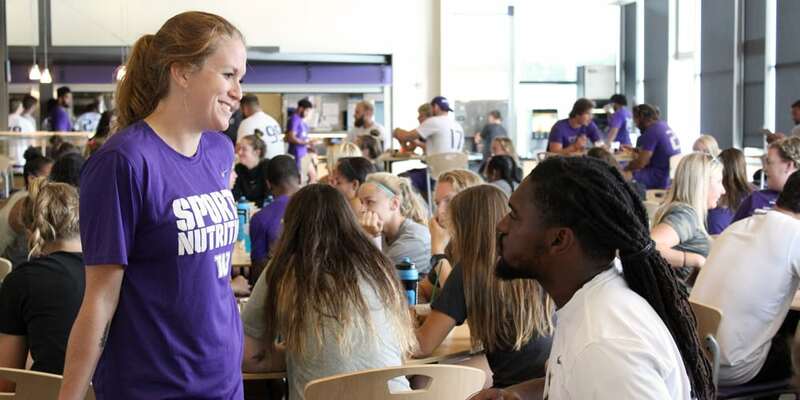 Working hand in hand with athletic trainers, two dietitians analyze the nutritional needs of every student-athlete. They teach them how to make the most of Training Table and also how to shop, cook and eat on their own. From grocery lists to recipes to cooking classes, student-athletes are well equipped to make healthy eating choices. “We believe in empowering our athletes to understand their bodies. We talk to them about performance but also their overall health, how to take this knowledge with you after you graduate,” explains dietitian Meredith Price. Without the support of Tyee Club members, this intentional focus on wellness for life would be impossible. For example, the Performance Nutrition Center located above the training/conditioning area provides the extras that help build champions. Before or after practices, student-athletes drop in to get healthy snacks like smoothies, hard-boiled eggs, peanut butter and fruit. And because of the education they receive, they know exactly what to choose. “In pre-season, they’re doing conditioning, so they need more carbohydrates as they burn a lot of calories during that time,” Meredith notes. Training is equally strategic, with every student-athlete receiving body composition analyses, functional movement screens and other assessments based on their sports and even coaching styles.